Emerging markets have been getting pummelled this year. Only a few years ago, the developed economies lamented on the surging emerging economies led by the fearsome foursome known as the BRIC (Brazil, Russia, India, China) who were ready to run over roughshod over the world. Capital was gushing into these countries without no end and as a result has pulled millions of people out of poverty and into a burgeoning middle class. That narrative has changed pretty fast. China as a result of over-investment, an uber speculative stock and property market is slowing, and questionable initiatives by the Government to prop up these markets has raised credibility issues . Russia appears to be going back to its old Iron Curtain ways. Brazil is knee deep in corruption scandals and is reeling from the commodity crash. India though seems to be the one country that has been able to withstand the exodus of capital. The election of a pro-business government led by Narendra Modi has created some excitement in that perhaps the country has reached a point where they are seriously ready to confront and conquer some of the historical warts (over-regulation, corruption, and social inequalities). Yes it's a bit rah-rah but there are nuggets of truth. There is definitely a critical mass of people in India that are growing up with a more entrepreneurial focus. They are English speaking, highly educated, and have a very strong work ethic. Out of the BRIC countries, I think India has long term potential to become one of the leading economies, and even bigger than China. Indians have been taking leadership positions in some of the most high profile brands in the world like Pepsi, Microsoft, and Google. I'm not saying this because I'm of Indian descent and I'm just supporting the team. The facts are there and it is what it is. I'm by no means dissing other Emerging Market economies. I think that now that people have tasted some western style consumerism, they will not turn back the clock and go back to some substandard level of living. I decided that I would like to include some long term exposure to the Indian stock market, I thought the best way was to buy a basket of companies that represent the 50 largest companies in India. The index is known as the Nifty 50. iShares has an ETF that tracks the Nifty 50 index. There were other ETF's that had exposure to smaller companies but I decided I wanted to own blue chip companies. The ETF is fairly liquid and has an MER below 1% which I think is reasonable for a country focussed ETF. I realize that emerging market stocks can be very volatile. As a result, I am in this position with an expectation of holding for a multiple years. I think over a long horizon, India has the tools and resources to develop into a significant economic player compared to the other BRIC countries. With Emerging Market stocks taking a major hit the past few months, I thought it would be good time to open a small position and to add to it periodically if there is further market weakness. Again, I evaluated the company and stock by asking the basic 8 questions. Coach, Inc. (Coach) is a design house of modern luxury accessories and lifestyle collections. The Company operates through three segments: North America, which includes sales to North American consumers through Coach-branded stores (including the Internet) and sales to wholesale customers; International segment, which includes sales to consumers through Coach-branded stores (including the Internet) and concession shop-in-shops in Japan and mainland China, Coach-operated stores and concession shop-in-shops in Hong Kong, Macau, Singapore, Taiwan, Malaysia, South Korea, the United Kingdom, France, Ireland, Spain, Portugal, Germany, Italy, Belgium and the Netherlands, as well as sales to wholesale customers and distributors in approximately 45 countries, and Other segment, which consists of sales and expenses generated by the Coach brand in other ancillary channels, including licensing and disposition. Its product offerings include watches, footwear, scarves and jewelry. 2) Who do they compete with? Coach competes with other aspirational luxury brands such as Tiffany, Louis Vuitton, and Michael Kors. 3) Who buy their products and services? Upper-income segments and middle class segments that aspire to project a higher status of living. Traditionally Coach products have been exclusively sold in North America but over the past few years, the company has been aggressively trying to expand its product reach to other global markets, notably China and Europe. 4) Will people buy their product over and over again? As a married man, I can confirm that women cannot have enough nice hand bags and accessories in their wardrobe ensemble. Up until the past few years, Coach has been seen as an "It" brand. Lineups to get into their stores where the norm as their handbags were much sought after. Recently though Coach has been upended by competitor Michael Kors which has seen its market share rise significantly. 5) Do they make money? Coach has been able to generate very high Returns on Invested Capital that are well in excess of their cost of capital. The company as a result has been creating a high level of Economic Profit. Over the past few years, Coach has lost market share to Michael Kors and has seen it's revenues in North America fall. Despite this the company continues to create tangible wealth. If they can create wealth in a down cycle than they should thrive when times are better. 6)What do they own and who do they owe money to? The company has over the years a very clean balance sheet with very little debt. They generate a very high level of free cash flow which allows them to finance operations internally. Recently Coach dipped into the debt market to finance the purchase of luxury shoe retailer Stuart Weizmann to take advantage of low interest rates but given the high free cash flows the company throws out it should fund it effectively. 7) How risky is their business? Fashion retail is a very volatile business. Brands that are hot and in demand one day can become duds the next day (See Lululemon, Gap etc). Fickle consumers can do that. Coach enjoyed an extended period as one of the goto luxury brands but over time the product mix got a bit stale and out of favour. Luxury brands tend to be a bit more sticky in terms of brand loyalty but Coach has had issues. One of the drivers of this has been a push to go down market with selling in factory outlets. It was a good move initially but over time the move has cheapened and diluted their value proposition. Coach then became more of a discount brand instead of a luxury aspirational brand. The Coach experience serves as a reminder that even luxury brands can fall ill to the whims of a fickle consumer. 8) Is the stock cheap? Relative to other similar luxury apparel brands Coach stock is cheap. On a growth basis, Coach is among the cheapest luxury stocks out there. Finally in terms of valuation the stock is trading well below its intrinsic value of the $40-50 range. It's cheap because the market isn't happy with its falling revenues in North America and doesn't think it can turn it around. The stock is trading in the high $20's compared to its glory days when it was in the high $50's and $60's. The stock is very much out of favour. So why did I buy it? Buying Coach is very much a contrarian play. It is not a hip brand right now and is in a down cycle. That being said the product line is very traditional and classic. I think like all things the pendulum in fashion retail can shift the other way and what was old can become new again. I also think too much of the negativity on the company is focused on the North American sales. The company is focusing more resources on the Asian and European markets. It appears to be bearing some fruit as sales in China just recently crossed $500 million. It's getting traction there because of government crackdown on graft which has made luxury brands non grata. The upper middle class is avoiding the obvious in-your-face luxury brand names and going one level down to less obvious but high quality Western based apparel. Coach may have a great opportunity to find a sweet spot. Despite falling sales in the Americas the company is generating positive Economic Profit and I'm always on the lookout for companies that can create meaningful wealth in a down cycle because when things ramp back up, the market will recognize. Its balance sheet is pretty rock solid and the stock is trading at a meaningful discount. It's definitely a turnaround play and I realize the stock may not do much and may even go lower. The company pays a pretty chunky dividend but that is not the reason I'm buying this stock. As always I have established an exit point when the stock falls past 20 percent. UPDATE: The Financial Post did an interview with the North American President on how they are approaching the repositioning of the Coach brand. The focus is about going back to first principles on what defined the company with less emphasis on promotional iterations. 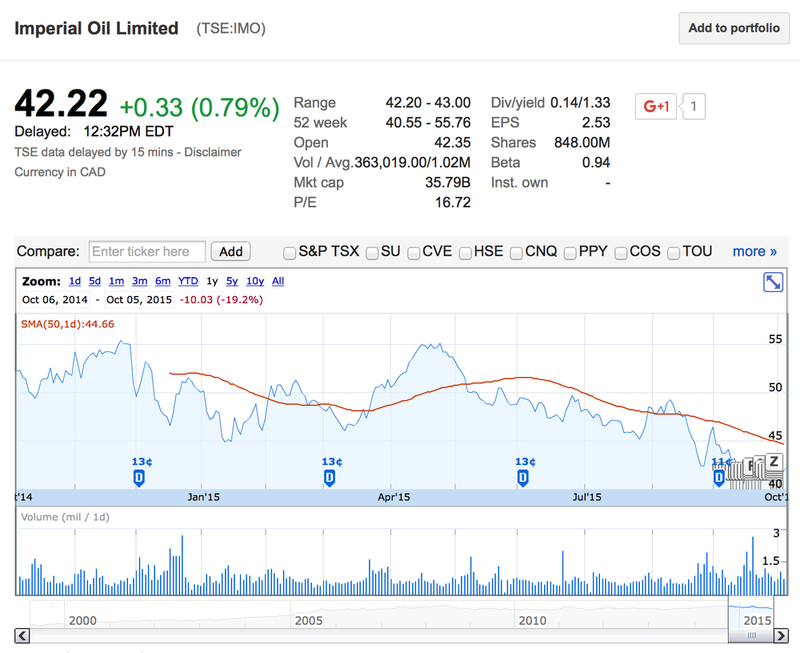 I took advantage of the pullback in oil stocks to add more to my contrarian position in Imperial Oil. I'm looking to periodically add and build the position when there are drops in oil prices. The fundamentals of the oil market are still in play. Demand is waning and there is still a glut of it out there and it is likely to continue for a significant period. At some point the relationship is going to flip as economies recover unfortunately there is no timetable and I'm not even going to try and wager a guess. One canary in the coal mine is currencies, specifically the US dollar. Commodity prices tend to trade inversely with the US dollar as most major commodities are priced in US dollars. A big reason for the crash in commodity prices has been a rising US dollar. With the Federal Reserve continuing to get cold feet to normalize interest rates, there could be pressure on the US greenback which could result in commodity prices catching a bid and going up. Again this is a long term play and I realize I will have to be patient to ride this one back up. Despite this depressed market, companies like Imperial Oil will continue to create tangible wealth and as long as dynamic is in play, the long term prospects for the stock are I think still good. I'm looking at my portfolios and with Imperial Oil, I know have a few commodity and resource companies building up (Southern Copper, a global water ETF, and Imperial) which I didn't a year ago. I feel that buying these type of companies at a depressed price will setup future gains in the long run when these core commodities ramp back up. Patience is the key. Coach also would fall into that category of a contrarian play. Not popular but they are financially strong enough that they can withstand the downturns and play successfully for another day.